Find your new best friend by adopting a pet in need! Use the database below to see the pets currently available at all Connecticut Humane Society locations. It’s updated every 5 minutes with a list of pets ready for a family. To learn about adopting from CHS, check out the adoption process and adoption benefits and fees. 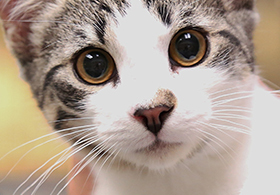 If you don’t find the right fit at CHS, visit the Animal Control Partners page to find more adoptable pets in Connecticut. Not finding the pet you’re looking for? Wondering if CHS has more pets? Click here for more information. Can’t adopt, but want to save pets? Make a gift to support the care of the pets while they wait to find their new family.